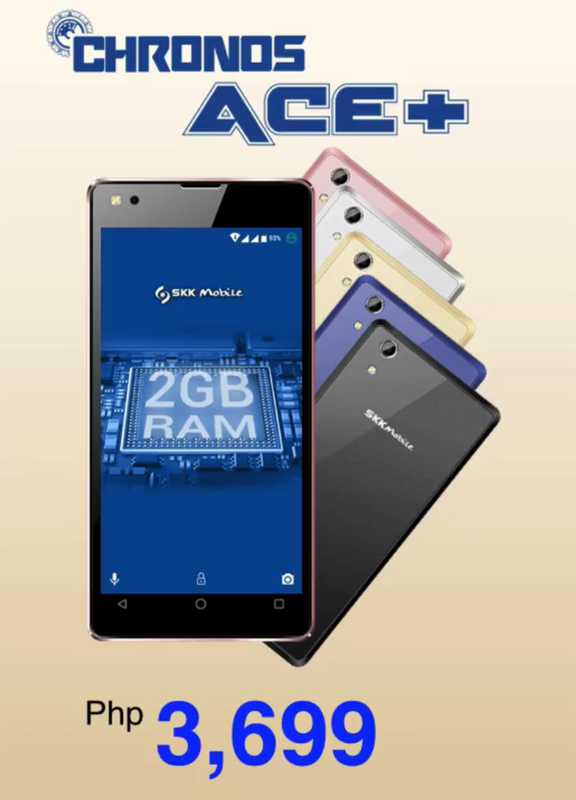 SKK Chronos Ace+ With 2 GB RAM Goes With A Low Introductory Price Of Just 2699 Pesos! Home / mobile / news / skk / SKK Chronos Ace+ With 2 GB RAM Goes With A Low Introductory Price Of Just 2699 Pesos! Great news! SKK Mobile posted on their Facebook page that the Chronos Ace+ will go with an introductory price of just 2,699 Pesos. Related: SKK Chronos Ace+ Unboxing And First Impressions - A Potential Wonder On A Budget! As a refresher, the SKK Chronos Ace+ is an entry-level handset packed with potentially the best specs for the budget today. It's equipped with a stylish design, 5 inch HD IPS screen, 1.3 GHz MT6580 quad core chip, 8 GB ROM, 2,200 mAh battery, 13 MP main camera, and 5 MP front facing camera. What's different here compared with the regular Chronos Ace is the RAM as SKK doubled it to 2 GB. For the price of 2,699 Pesos, this handset is probably the currently the most affordable phone with 2 GB of RAM today.